Lonnie Wheatley, TULSA, Okla. (March 31, 2016) – With the month of March coming to a close, it is Shane Stewart carrying the STIDA Winged 410 Sprint Car Power Rankings lead into April. 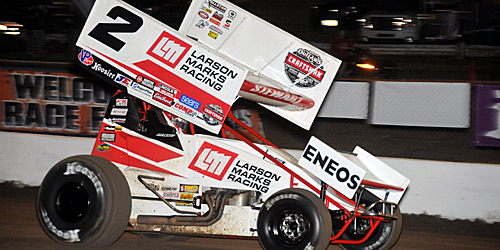 The Winter Heat champion and currently second in World of Outlaws points, Stewart holds a 26-point advantage on the strength of three wins among his ten top-fives and 16 top-ten feature finishes. It’s the same lead he held in the initial STIDA Winged 410 Power Rankings released on March 9, however now it is Posse rep Greg Hodnett moving into second by just two points over Daryn Pittman. Hodnett posted his third win of the year with last Friday’s Williams Grove triumph, just enough to push him up to second. Pittman holds down third, while current WoO points leader has climbed to fourth with Donny Schatz right on his heels in fifth. The rest of the current top ten includes Joey Saldana, Dale Blaney, Jason Johnson, David Gravel and Danny Lasoski. Stewart was also the top Power Rankings point earner for the month of March, racking up 110 points to edge Schatz (106) and Sweet (102) for the month. January Top 5: 1. Shane Stewart 103, 2. Dale Blaney 96, 3. Danny Lasoski 84, 4. Daryn Pittman 74, 5. Greg Hodnett 68. February Top 5: 1. Brad Sweet 116, 2. Donny Schatz 103, 3. Greg Hodnett 90, 4. Daryn Pittman 82, 5. Dale Blaney 75. March Top 5: 1. Shane Stewart 110, 2. Donny Schatz 106, 3. Brad Sweet 102, 4. (tie) Greg Hodnett, Daryn Pittman and Joey Saldana 85. Formed in 1998, STIDA (Short Track Independent Drivers and Associates) is an international company serving the safety and insurance needs of drivers competing in any country. Get covered now by calling 1-800-378-4608 or get more information by checking online at www.stida.com. A part of the recurring “The Wheatley Chronicles” series of articles on www.sprintcarmania.com, the Open Wheel Power Rankings are determined by cumulative points based on a sliding scale dependent upon car count at Sprint Car and Midget events across all sanctions and non-sanctions throughout North America. The current Rod End Supply Winged 360 Power Rankings were released yesterday. The initial Infinity Shocks Non-Wing 410 Power Rankings, Beaver Stripes Non-Wing 360 Power Rankings, midgetmadness.com Midget Power Rankings and 305 Power Rankings presented by Dodge City Raceway Park will all be unveiled next week. 2015: 1. Donny Schatz 1,480, 2. Greg Hodnett 1,089, 3. Shane Stewart 1,033, 4. Danny Dietrich 961, 5. Dale Blaney 931, 6. Joey Saldana 923, 7. Kerry Madsen 920, 8. Danny Lasoski 903, 9. Daryn Pittman 876, 10. Brad Sweet 874. 2014: 1. Donny Schatz 1,476, 2. Daryn Pittman 1,219, 3. Kerry Madsen 1,083, 4. Paul McMahan 1,040, 5. Dale Blaney 975, 6. Joey Saldana 895, 7. Greg Hodnett 871, 8. Brad Sweet 783, 9. David Gravel 715, 10. Danny Dietrich 624. 2013: 1. Donny Schatz 1,089, 2. Daryn Pittman 925, 3. Fred Rahmer 764, 4. Paul McMahan 728, 5. Lance Dewease 673, 6. Greg Hodnett 668, 7. Tim Kaeding 624, 8. Dale Blaney 591, 9. Tim Shaffer 549, 10. Brian Montieth 545. The Wheatley Chronicles brings insight and highlights from all variety of racing series throughout the nation in 2016 and beyond along with the Open Wheel Power Rankings on a regular basis. Please send any comments, questions or advertising inquiries regarding The Wheatley Chronicles at www.sprintcarmania.com to Lonnie Wheatley at lonniewheatley@gmail.com.